ZOSI Home Security System is the product that is the topic of discussion today. We will here look at some of the best features that make this security camera system stand out from other security cameras. If we are to go by the market reviews, then it is pretty obvious that most of the reviewers have given positive views towards the product. This review will help you decide that whether you should opt for this product or not. When we think about security cameras, the ancillary objects present in the package play a key role in proper functioning of the product. Therefore, we will first look into the package of the security system. The package of the camera includes a 500 GB hard drive which will give you enough storage space to record the footage.You will find 8 CCTV cables which will help you set up the security system around your house. Moreover, there will be 8 800TVL Cameras that will be either mounted or hanged from strategic positions to cover the entire house. There will also be 2 1 to 4 power splitter cables which are there for the purpose of proper channelling of power. There is a H.264 8CH 2D1 +6CIF DVR that helps you with the surveillance procedure. Last but not least in the content list you will find 1 IR control and a mouse which will help you in the functioning of the security system. This product stands out for various reasons. As we have seen in the specifications, the cameras have 800TVL horizontal resolution. This is one of the most advanced resolutions that you will ever find in the market which makes this camera so special. The camera has aluminium casing which helps it withstand any weather condition and can be placed anywhere the customers deem fit. The IR distance of the camera ranges around 40m or 120 feet which is also one of the highest in the market. This product is waterproof and therefore it will have no problem during rains; you will still get your recordings as and when you need it. You will have a clear view of your surroundings, thanks to the 4.6mm camera that is fitted inside. The total number of LEDs amount to 42pcs which will give you clear night pictures. There are a number of features that will set this product apart. First let us talk about accessing the feeds remotely. This is a topic that needs proper discussion and you will find that the camera feeds can be remotely accessed from your PC, MAC, tablet, android, Smartphone and other smart devices without any problems whatsoever. This security system is also privy to motion detection. This means that if the system detects any motion, then it will send you an email to your official email id with pictures instantly so that you are aware of it. The camera has a memory of 500 SATA hard drive which is capable of storing a lot of data that you can use. You can simply play it or view it directly, as per your convenience to make sure that you are accounting for every detail that needs to be checked. The high resolution of the camera makes sure that the recording is clear as crystal. Moreover you can record the feeds in different modes such as motion detection mode, normal mode, etc. This helps you to record in the mode that you want and deem fit, according to the situation. There is no doubt that if your camera is waterproof then it can be used in ways different from the more traditional ways. The first thing is that it can be placed anywhere in the house including the garage so that you can keep an eye on the prospect of car theft. The waterproof level of the camera is IP66 which is commendable and not bad at all. 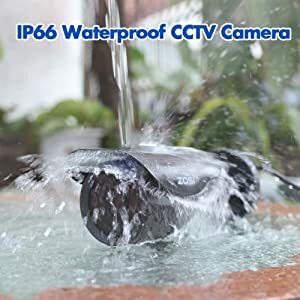 Although this is a waterproof product, still be careful that water does not seep into the camera as it can damage the camera beyond repair. You can simply change the boot screen if you feel the need for it. Moreover the device can support up to 10 different languages. You will also get one year quality warranty from the company as well as lifetime tech support from them, which is an advantage in case of damage. This product supports only internet explorer browser, so make sure that you have the browser, else you will face problems. The power supply of the product is 12V or 2000mA and you need to make provisions for it beforehand. After going through the detailed overview of the ZOSI Home Security System we can conclude that the security system is worth the money. With night vision feature of the product that gives black and white pictures at night we can safely say that the camera works fine during both day and night. Plus, you get HD picture at all times which can only be an advantage and is worth a try. I absolutely love your site.. Pleasant colors & theme. Did you develop this website yourself? Please reply back as I’m attempting to create my own site and want to know where you got this from or exactly what the theme is named. Thank you! 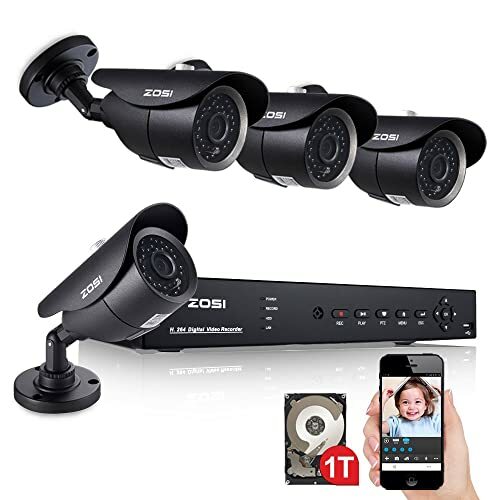 I purchased a 4-camera, 8-channel DVR system (but I elected to supply & install my own HDD since I had a surplus of them at home & was cost effective). The cameras are durable, easy to install & take crystal clear pictures with great resolution. The DVR is exceedingly simple to set up; very self-explanatory once u open it up for HDD install. The DVR for me however has proven a bit more complex with regard to its operations beyond initial set-up! No worries there tho, any time I have a problem with any of the components, I just email the efficient folks at ZOSI & have always hear from them within a days time or before. For the money, this system is outstanding & I’d recommend it to most anybody & have a few family and friends who are planning to purchase from ZOSI as well. THANK YOU for allowing me to share my experiences with this fine company. I purchased the Zosi Model ZG2317a October 2015. What is the warranty time and the replacement procedure. I purchased a four camera WiFi system with a 2TB hdd. It is asking for an password which I cannot find in the directions at all. It defaults to a user name admin but no where does it give me a password so that I can change and use my own password. Any help would be grateful. Thank you. Main navigation Go to DVR-Setup-User-Choose the users you need to change, then double click the “admin”, “Change password” pops up, please input the old password and then reset the new password and confirm it. I recently bought an 8 camera wireless system with 2Gb harddrive. When i plug in the cameras , they don’t show up on my monitor. I tried hooking one up with a cat5 cable and it works fine. I tried resetting the system but with no luck. Any information is appreciated. I installed a 4 camera wireless system at my daughter’s house and that one works flawlessly. I accidentally changed my setting to HDMI and now its showing input not supported. I can’t get to the menu screen to change it back. Can you please help me before I take a hammer to it. I have it connected to a flat screen monitor with a VGA cord. Can someone tell me when I’m reviewing footage from earlier in the day how do I save images of something that I captured? Do you test the motion feature of this system really? I still trying to find the motion trigger when people walking , moving without success, only false alarms are triggered. I think this feature is very important otherwise you must stay in front of monitor always to see if someone come to your house? Sincerely the support is good, very nice, but without success. You can designate where in the view of the camera the motion detector will or won’t look.